"Be careful of this philippino helper! Her name is Michelle Romero Tolentino, 41 years old worked with us for 22 months. She has a very pleasing personality but is a CROOK. We employed her in Hong Kong and moved her to Singapore with us. This new year she lied to us that her husband was shot in Philippines and died the next day and went back home in urgency. While we booked her return ticket till her province, Laog. After two hours of her leaving our home, Loan sharks started calling us. In due course of time we have got to know that she has taken loan of thousands of dollars from various unlicensed money lenders who have been threatening us every day till today through calls and whatsapp and sms. ( She gave my name and phone number as guarantor ). Also, she has taken loan on many other philippino and Indonesian helpers' names. Poor helpers have to pay them back. And now Michelle is absconding, there is no way we can reach her. My request to all of you is to please check the profile of helper before you employ them. And DO NOT EMPLOY HER! She should be blacklisted from working anywhere." Facebook user Ruby Mathur has alleged online that her domestic helper returned home under the guise that her husband was shot dead, when in reality she was simply fleeing from loansharks who were after her after she had racked up thousands of dollars in debt. 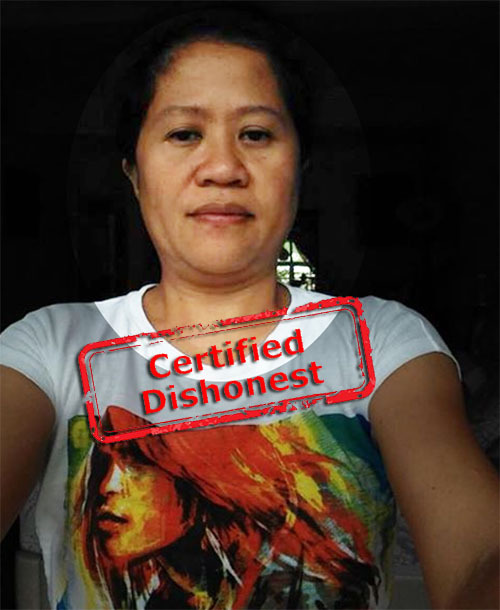 Mathur, a Singapore resident, posted in the SG Transfer and Direct Hire Maids Facebook group over the weekend and revealed that her Filipina domestic helper, 41-year-old Michelle Romero Tolentino, has been with her for nearly two years. Mathur’s family employed Michelle in Hong Kong and brought her over to Singapore when they moved here. Mathur wrote that Michelle had a “very pleasing personality” – that is, until Mathur found out what Michelle had allegedly been up to. Besides taking out loans under Mathur’s name, Michelle also allegedly used the names of other Filipina and Indonesian domestic helpers’ names before fleeing, leaving the helpers to pay the loansharks back. Mathur appealed to netizens to remain cautious before employing domestic helpers and urged fellow employers to blacklist Michelle. Moneylending is a legitimate business in Singapore with an illegal twist to it. Loan sharks parade around as moneylenders, offering you loans without full disclosure of the terms and conditions of the loan, and when you default on your payments they hound you, calling and texting and threatening, and their interest rates can increase to outrageous percentages on a daily basis. Even though there are strict laws that govern moneylending activities, people still fall prey to the loan sharks in Singapore, and this shouldn’t be so. One of such examples is that of maids, or your domestic helper borrowing money from loan sharks and implicating you in the debt. Yes, this is a thing: your maid can use your name and number and take a loan, and when it is time to repay, you get saddled with the debt, because you unknowingly became her debt guarantor. Having a domestic helper or maid in Singapore is actually a very normal thing, especially when you have a very busy schedule and neither you nor your partner (if any) has the time to take care of the house and cook meals after hours at work. You can get a domestic helper for part-time or full-time, depending on your needs and wants. A part-time helper is one who has keys to your flat or apartment and comes in a couple of days a week to clean, cook and stock your refrigerator with groceries. Part-time helpers are relatively cheaper than full-time helpers. A full-time helper, usually called a foreign domestic helper and the person must be living in Singapore for the sole purpose of being a full-time domestic helper. She must live in your house, which means that you have to provide them with spacious accommodations in your house, such as a large enough room that has a bathroom. You are also responsible for their meals, health care, and a return trip ticket to their country of origin (as stated on their record). You are required to pay a monthly fee of S$265 to the Singaporean government to buy a bond that will cover the fees if your helper decides to run away. Helpers tend to run away when they have been mistreated by their bosses, and sometimes it is this poor treatment that makes them borrow from loan sharks and saddle you with the debt. Encourage honesty between you and your domestic helper. You can do this by showing them that they can trust you; being nice to them, and being willing to listen to what they have to say. Some employers treat their maids as though they are not intelligent enough to have an opinion, and this is just wrong. Treat them as you would want to be treated in their position, and they will be honest and open with you. Make sure they know about loan sharks and unlicensed moneylenders and how to identify them. They should not reply any messages telling them to take instant cash loans without documentation. Tell them they should approach legal moneylenders and offer to go with them if there is a need. They can access a list of legal, licensed moneylenders in the Registry. Let your domestic helper understand the dire consequences if they loan from illegal moneylenders. Loan sharks will ask your domestic helper for your SingPass login password so as to verify your address: she should not give it to them. Don’t leave your SingPass letters or bills with your personal information lying around in the house, neither should you leave your NRIC unlocked. This will prevent a temptation to steal your identity and take out a loan under your name or unnecessary embroil you as a guarantor. Emphasize the importance of keeping private details private. Do not disclose any personal information to people she does not know, or people of questionable character. If your domestic helper or maid approaches you and tells you that they have borrowed money from a loan shark, do not go off the bat making unfounded accusations. Keep a calm, level head and sit them down. They may not follow up immediately, but file a complaint with them anyway. The Ministry is highly against illegal loan shark activity in Singapore, and reporting them will put them on the lookout for the loan sharks. Immediately change your phone numbers. Without a number to reach either of you on, the loan shark will be deterred in his quest to fleece you for money. Install a security camera will either deter loan sharks from harassing your family or capture them in action. This additional evidence can help the police in capturing the criminals. Having a domestic helper in Singapore is a good idea if you need one and you know that you can adequately provide for them. While they may have needs that require additional finances, encouraging honesty and openness will deter them from going to loan sharks to get loans. Educate your domestic helper on the availability of legal, licensed moneylenders in Singapore, and they can easily find them by looking at the Registry for the list of licensed moneylenders in Singapore, then they can approach a few to see about getting a loan without leaving you indebted to loan sharks.